2 minute Maggi – a tasty and instant food loved by everyone including children. So why don’t we try different recipes using this Maggi Noodles? 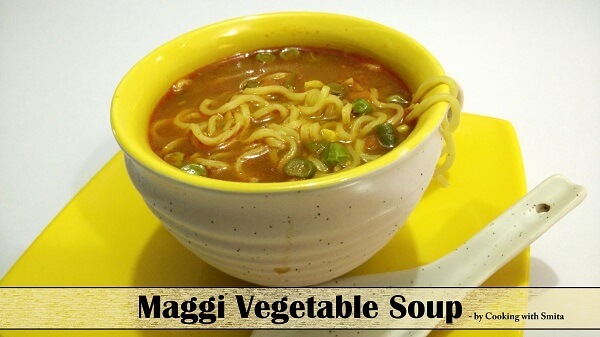 Today I am sharing an easy recipe of Maggi Vegetable Soup made with Masala Maggi Noodles. 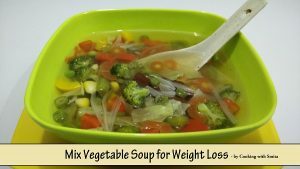 Healthy Soup is full of vegetables and nutrients. Try this delicious and healthy Vegetable Soup at home this winter. Add chopped Garlic and sauté for about 30 seconds. Now, add all vegetables including Green Peas and Green Chilli, sauté for another 1 minute. Pour 2 & ½ cup water into the pan. Now, add all spices – Red Chilli Powder, Maggi Masala Powder and Salt. Stir and let cook over medium-high flame until it starts boiling. When water starts boiling, add Maggi Tastemaker Masala (which comes into the packet of Maggi) and add Maggi Noodles. Cook for 4 to 5 minutes, stirring occasionally. After 5 minutes, switch off the gas. Maggi Vegetable Soup is ready to serve.